gold plated rising star award is mounted to a mahogany finish base to create this elegant award to honor any up and coming star performer. Masterfully carved rough and smooth stone give this award classic elegance in white agate or ebony. The star is the symbol of emerging talent or the mega-accomplishment of an existing genius. 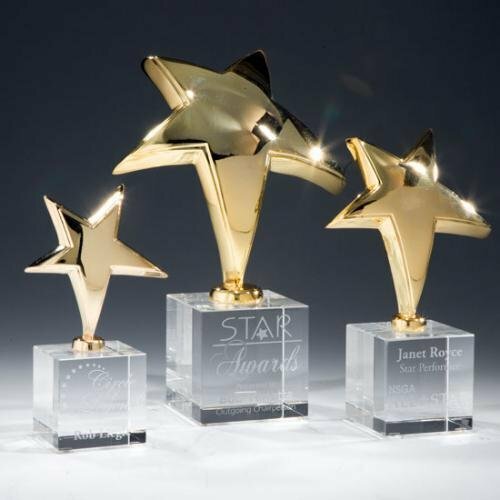 Honor that achievement with these singular star awards mounted to hand-cut optical crystal bases. The Rock Star protrudes abruptly from a solid blue crystal base, giving breadth to the overall design. 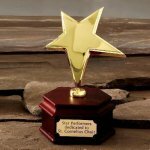 This award can be customized in many ways using color fill, an etch, or a variety of other options. Your imagination is our only limitation. 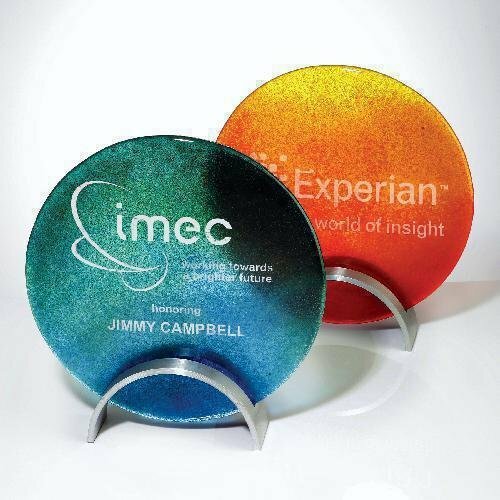 The color graduations of these 100% recycled art glass awards feature strong rich colors that flow into each other creating hues of blue-greens or yellow-reds. They are displayed in elegant brushed aluminum curved bases. As with any specially hand crafted art, irregularities are considered a natural part of the beauty of the piece and not a defect. Rose Piano Finish Plaque with 1/4" beveled clear glass. All piano finish plaques ship assembled and in an elegant and practical presentation box. Floating Acrylic Plaque Rosewood Piano Finish Including Mountable Scallop Rectangle Acrylic Laserable Plate With Felt Back Individually Boxed 9" X 12"
Floating Acrylic Plaque Rosewood Piano Finish Including Mountable Scallop Acrylic Laserable Plate With Felt Back Individually Boxed 8" X 10"